Hi Folks! As allways stuff never turns out the way hoped for. But, hey, we’re just trying to have some fun. 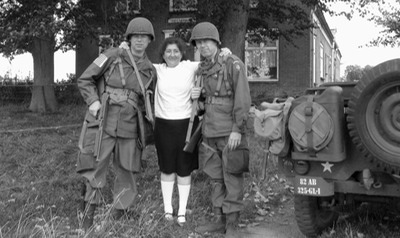 The idea was to organize a big reenactment event for the upcomming commemoration of the Holland Jump. Officialy known as the airborn part of the Market-Garden plan. Well, we just didn’t got the word out to many people and probably to late too. But we made the best of it. The idea was to concentrate on the 307th medical battalion, which arrived by glider on Landingzone Nan. Having found a spot next to the original landing site, we set up a piramidal tent for quarters and started out our little trips to the surrounding area and historical sites. Did we walked? Heck no! For transport we brought the famous jeep. Well, two actually. One standard jeep with 505th markings and one medical jeep with the 307th marking. 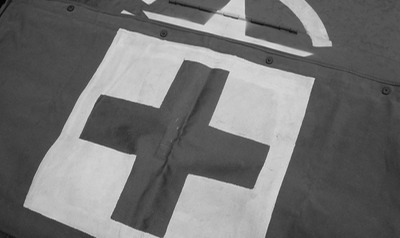 After some reaserche it was clear that the 82nd Airborne Division used a specific design for their ambulances. It was a simple wooden construction on the back of the jeep to carry two stretchers. These wooden constructions demanded no welding or alternations to the body of the jeep, but were simply placed on top of the body and tied down. A big red cross was painted on the windscreencover by hand and that was it. All it needed to complete the picture was two GI’s. To portrait the 82nd troopers in Holland, there are some details to keep in mind. Allthough they recieved the new M43 uniforms, they still used the gauze flags like the ones they on previous campains (click here for a picture of an original unused flag). 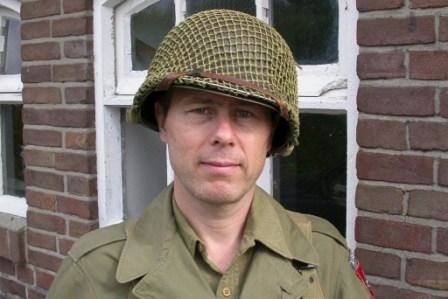 The 101st used the oilcloth armband. Pockets were added to the new pants. These pockets were made from the heavy fire-retarded duck canvas, which came from new rolls. No tents or duffelbags were cut up for this. The majority of the 82nd used the British netting (see photo) on their helmets, most of them still had theirs from the Normandy campaign or were issued new ones. Wanna get an idea what I’m talking about? Please feel free to try the photogalleries. The Photo Gallery contains our little reenactment scene’s, with some photos made earlier and some from last event. In the earlier ones we used the wrong flags (cut down oilcloth flags). I know, but sometimes you start digging for these little facts after the event. We just keep on learning.